This week we worked on Reverse Prayer Pose, a very difficult technique for some of us. Greater success is possible using a Wall Rope. In this video, Mr. Iyengar demonstrates Tadasana Paschima Namaskarasana around 12:00. Please note how far his shoulder blades travel out, to accept the hands and how much they return to open the chest. Starting around 15:00 he gives further details. For those of you unable to do it, please practice Tadasana Paschima Baddha Hastasana or holding above the elbows in back while in Mountain pose, demonstrated around 11:00. A simple way to install Iyengar Wall Ropes is by purchasing Over the Door Hangers from Yogawall.com and pre-tied ropes from Yogaprops.com. If you would rather tie your own, watch this how to video. 12′ of rope is likely necessary to do the knot and have a long enough wall rope. A second way to tie one’s own is using a double Triple Fisherman’s. Susan G. Clark has a much more detailed video on YouTube on how to do this second knot. If you experience back pain or discomfort, are diagnosed with scoliosis or simply want a better understanding of this area, this 2 hour class is ideal for you. Muscles along the spine are only a minor element affecting posture. Included are the ligaments and fascia of the sacrum, lumbar and thoracic spine. This hard working tissue is locked ‘short’ and tight through continuous use, especially when posture is imbalanced. Conversely, aging, injury and daily slumping flex the spine forward and lock the back area ‘long’. Rafael will show ways to lengthen and strengthen muscles, ligaments and fascia related to the spine. Relaxation postures will be included. Handouts will be provided. For all levels and abilities. Pre-registration is encouraged. Need more information? Contact Rafael. Enrolling in person or by mail? Download the enrollment form. Enrolling with PayPal? Use the button. Image: Plate 409, Gray, Henry. Anatomy of the Human Body. Philadelphia: Lea & Febiger, 1918; Bartleby.com, 2000. 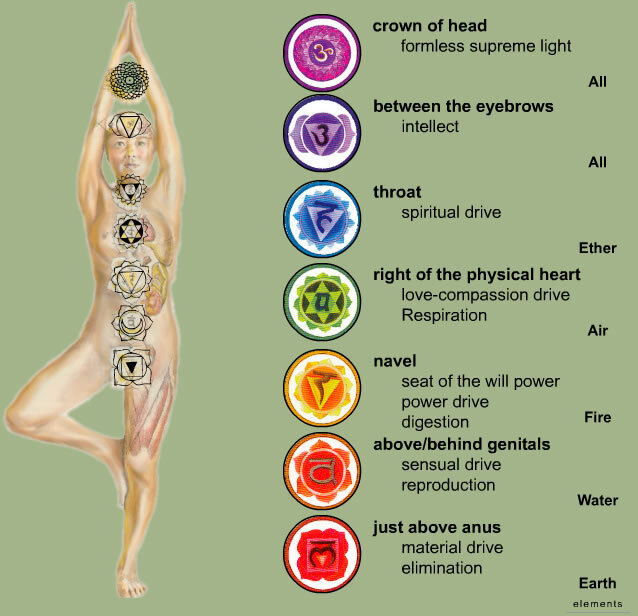 Iyengar Yoga does not necessarily talk about chakras, yet you may be interested in this. Instructions in this site may differ from my own, but use as reference if necessary. Anchor back of sit-bones down (while raising front pelvic crest), keeping toes spread and nail-roots grounded. Decompress spine out of pelvic bowl, broaden collar-bones and move inner-blades toward sit-bones. Join palms at Heart Center, helping keep top of breast-bone over bottom and release base-of-neck. Take shoulder skin downwards to outer-elbow. From inner-elbow, release skin upwards to finger-tips. Move Heart-energy towards base of brain during IN-breath (pause when finished) and Brain-energy towards brain-stem during OUT-breath (also pausing when finished), then repeat. Mentally touch Crown, Bridge-of-nose, Throat and Heart centers during ‘Oooo’. Navel, Genital and Base centers during ‘mmM’. Tilt skull, gaze at Heart-center, place palms on lap during OUT-breath. Raise head, open eyes during IN-breath. Dismount. “What Vietnam Taught Us About Breaking Bad Habits” is a story broadcast on Morning Edition I spoke about recently. The numbers 60, 30, 2 I recalled are a bit different than the actual 40, 20, 5. My apology! The main aspect is about behavior change.